Seed tissue (endosperm), used fresh or dried. 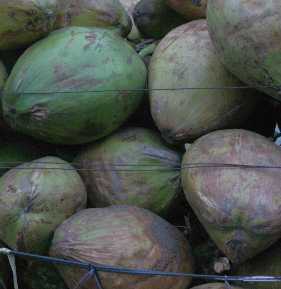 The sour liquid inside the young seed (coconut water) is a common refresher in tropical countries; it must not be confused with coconut milk (see below). 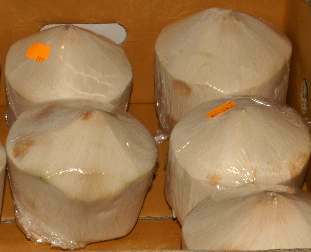 Coconut water is rarely used for cooking. The endo­sperm has a pleasant, mild and nutty fragrance and a typical taste, with a hint of sweet­ness. Khopra (desiccated coconut) contains about 60 to 70% coconut oil. Coconut oil is composed, as might be inferred by its high melting point of over 32 °C, mostly of triglycerides of saturated fatty acids. Lauric (dodecanoic acid; 40 to 55%) and myristic acid (tetradecanoic acid; 15 to 20%) dominate, but several other fatty acids are found at concentrations of 5 to 10%: The two short-chain acids caprylic (octanoic) and capric (decanoic) acid (which are responsible for the smell of overaged coconut oil), the long-chain palmitic acid (hexadecanoic acid) and oleic acid, which is the only unsaturated fatty acid found at significant amounts. Consequently, the iodine index is very low (typically, below 10). See also sesame on the topic of plant oils. The typical coconut flavour is caused by several δ-lactones of aliphatic hydroxy-carboxylic acids, ranging in chain length from 8 to 14; 5-decan­olide (5-pentyl­oxan-2-one) is the most important single compound. Synthetic coconut flavourings often contain a homologous γ-lactone, 4-nonan­olide (pentyl­oxolan-2-one), which is not found in coconuts. 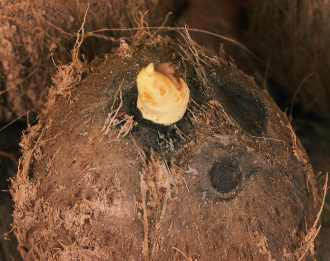 Toasting coconuts leads to pyrolysis of maltose and glucose, whereby new fragrant compounds are formed: maltol (2-hydroxy 3-methyl γ-pyrone) and cyclotene (cyclopentenolone, 2-hydroxy 3-methyl 2-cyclopenten-1-one), respectively. Furthermore, a great number of alkylpyrazines were identified (pyrazine, methyl pyrazin, dimethyl pyrazines, vinyl pyrazin, isopropyl pyrazin). The coconut tree stems from the Southeast Asian peninsular (probably Malaysia), but is cultivated in tropical regions all around the world. Older books often speculate about a Polynesian or even American origin of coconut, but recent developments have shown this view almost certainly wrong. 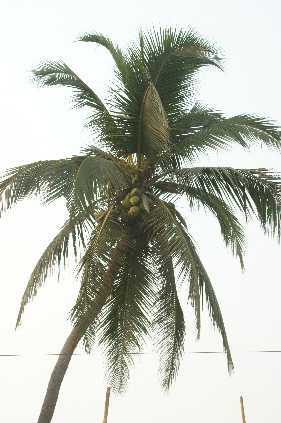 In all probability, the coconut tree was first cultivated by peoples of India or Southeast Asia; emigrants from these countries then introduced the coconut tree to almost everywhere in the tropics of Asia and Oceania. 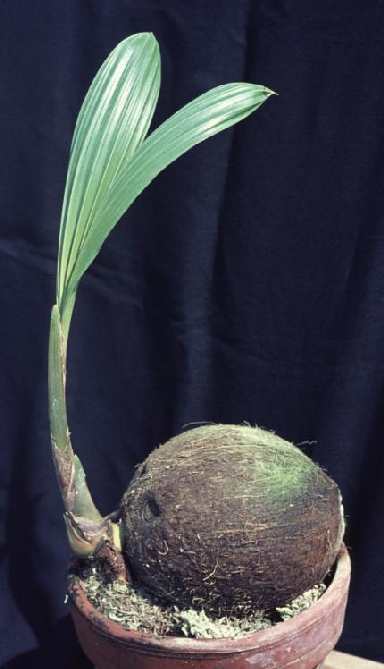 There is no proof of coconuts having grown in America before the arrival of the Spaniards; this is curious, however, since the closest relatives of the coconut palm are of American distribution. 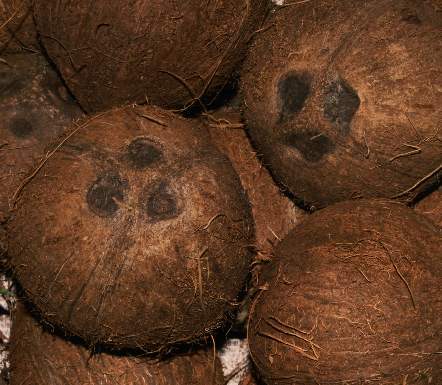 Coconut and its re­latives in other Euro­pean lan­guages goes back to Spanish coco spectre, goblin , with ref­er­ence to the three marks on each coco­nut which make it look like an eerie face. The botanical species name nucifera is a neo-Latin formation meaning bearing nuts (nux nut and ferre bring, carry, bear ). 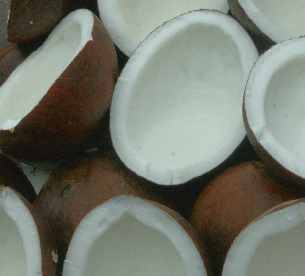 Almost all names of coconut in Indic languages are related, e. g., Hindi nariyal [नारियल], Urdu nariyel [ناریل], Punjabi narial [ਨਾਰੀਅਲ], Gujarati nariyel [નારિયેળ], Marathi naral [नारळ], Bengali narokel [নারকেল] and Telugu narikelamu [నారికేళము]; cf. also Mongolian nargil [наргил]. These and other names go back to Sanskrit narikela [नारीकेल], whose origin, however, is not Indo–European. 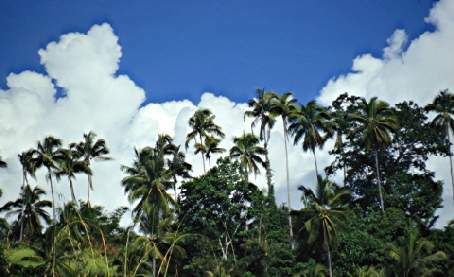 The first element resembles several Austro­nesian names of coconut, e. g., Tagalog niyog, Malaysian nyiur and Hawaiian niu. In Tamil, the related word ney [நெய்] has the generalized meaning semi-solid fat , paralleling similar constructions for other oilseeds (olive, sesame). Farsi has a related name for coconut, nargil [نارگیل], which lies behind the Persian term nargileh [نارگیله] for water pipe , since coconut shells can be used as pipe bowl. The word entered many languages as an exotism for oriental tobacco pipes. Some names of coconut, e. g. Maltese ġewża ta’ l-Indja and Armenian hentgagan engouz [Հընդկական Ընկոյզ], literally mean Indian nut ; note that some languages use similar designations for nutmeg, although both plants actually do not originate from India. See also turmeric for the etymology of India . 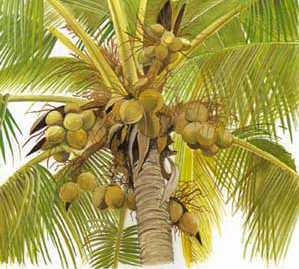 The coco­nut palm is a plant character­istic of tropical coasts, being grown es­sen­tial­ly world-wide in our days. 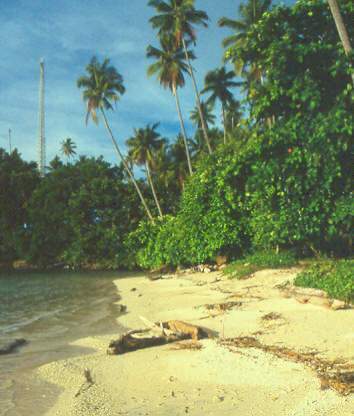 Con­sequently, its rôle in the cui­sines of tropical peoples can hardly be over­estimated. Further­more, coco­nut pro­ducts have been well-established in the pro­duction of sweets, where their im­portance is not restricted to low latitudes. 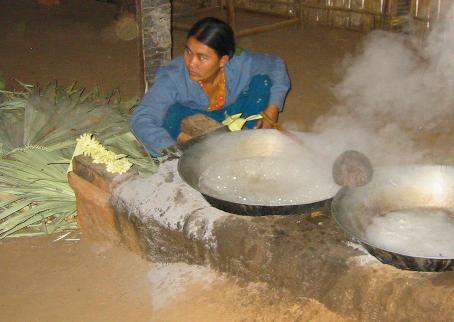 Cooks in tropical Asia make multiple uses of coconut products: Coconut water is drunk directly out of the unripe fruit as a common refresher; the grated and dried endosperm (khopra [खोपरा]) is used to thicken sauces and the oil pressed from the endosperm is a popular frying medium. From the sweet juice obtained by cutting young stems of several palm species (besides the coconut palm, mostly the palmyra palm Borassus flabellifer and particularly the kittul palm Caryota urens), the tasty palm sugar is obtained (called gula merah red sugar in Indonesia and jaggery in India); alternatively, the sap can be fermented to yield toddy (Indonesian: tuak), an alcoholic beverage. From toddy, the highly intoxicating drink arrack is prepared by distillation, and further fermentation of toddy gives the mild palm vinegar. Yet the coconut product most important for cooking is coconut milk, called ka thi [กะทิ] in Thailand, nuoc cot dua [nước cốt dừa] in Vietnam, santen in Indonesia and gata on the Philippines. Coconut milk is made by processing grated coconut with hot water, thereby extracting oil and aroma compounds. The result is a milky–white, opaque emulsion (up to 20% fat) with a sweet coconut flavour. After some time, fat and water may separate (as in unhomo­genized cow milk), yielding thick coconut cream . Coconut milk is an ex­treme­ly im­por­tant in­gredient for many cui­sines of Asia. To pre­pare it in a Western kitchen, the tradi­tional, but time-consuming, method may be emulated by blen­ding desic­cated coco­nut with hot water in a food pro­cessor; even simpler is the use of industrially pro­duced coco­nut extracts ( creamed coco­nut ), sold in blocks to be dis­solved in hot water; 200 g creamed coco­nut are suf­ficient for either a half liter of thick or one liter of thin coco­nut milk. Personally, I find coconut milk powders less recommendable, since they contain additional dextrines to prevent lumping and have their fat content reduced; particularly the latter results in a more shallow taste. 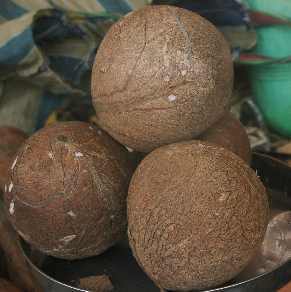 Gravies containing desiccated coconut are popular in Southern India (sometimes in combination with yoghurt). 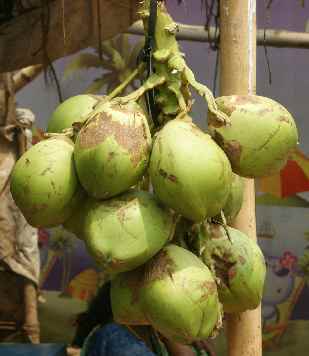 Most famous for coconut usage is Kerala, a union state in the very South West of India; people even say that there are as many coconut trees in Kerala as stars in the sky. Desiccated coconut is commonly ground together with asafetida, cumin, coriander seeds, chiles and toasted lentils or beans, yielding spice pastes (masalas) characteristic of a particular dish. Coconut oil is the most typical frying medium in Southern India. A typical ex­ample of a vege­tarian specialty con­taining coco­nuts is bisi bele or bese bele [ಬಿಸಿ ಬೇಳೆ] hot lentils , a rather dry dish made from vegetables, legumes and rice; the recipe stems from Bangalore, capital of the Southern Indian union state Karnataka. Boiled vegetables are mixed with puréed lentils and flavoured with tart tamarind water and a sophisticated spice mixture made from lentils, split peas, coriander, cumin, fenugreek, chiles and shredded coconut toasted brown together with smaller quantities of cinnamon and cloves. After steamed rice is added, the dish gets additional flavours from curry leaves fried shortly in butter (see ajwain on the topic of the co-called perfumed butter or tadka [तड़का]). Coconut chutney, named kobbari pachadi [కొబ్బరి పచ్చడి] in Telugu and tengai togaiyal [தேங்காய் தொகையல்] in Tamil, is widely eaten in South India, always accompagnying the common breakfast breads , i. e., idli or masala dosa. It is made from a fresh coconut that is grated and mixed with water, and seasoned with chiles, toasted dried legumes and black mustard, furthermore lime juice and curry leaves. 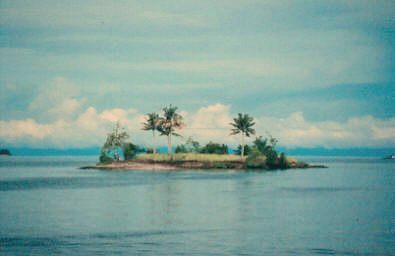 Even the smallest island can support some coconut trees. Coconut pro­ducts are ubi­quitous in the cui­sine of Sri Lanka, an island near India’s South Eastern shores. Hardly any of the curries Sri Lanka is famous for is made without at least a table­spoon of coco­nut milk, which at the same times thickens, gives more body and intensi­fies the flavour. Sri Lankan curries owe their character to coriander and cumin seeds, both of which are toasted to a dark brown before usage; further spices typical for this island are curry leaves, cinnamon and cardamom, more rarely pandanus leaves and lemon grass, all of which are native to Sri Lanka or at least widely cultivated. Chiles are used with a lavish hand. The bowl-shaped breads typical for Sri Lanka, called hoppers (properly appam [අප්පම්, அப்பம்]), are composed of rice flour, coconut milk, and yeast (traditionally, fermenting coconut sap is used). From these ingredients, a thin pouring dough is made, which is then fried to a crisp texture in hemispherical pans. It is often eaten with another coconut concoction named pol sambol [පොල් සම්බෝල්] which is the Sinhalese version of coconut chutney: A moist and crumbly mass of freshly grated coconut seasoned with chile powder, chopped onions and lime juice. 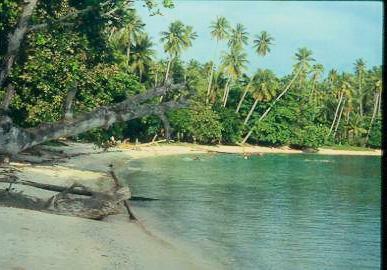 Coconut is of eminent importance on the multitude of islands that belong to Indonesia. A specialty of the minangkabau people in Western Sumatra is rendang, beef or buffalo cubes cooked in coconut milk together with a multitude of spices (see greater galangale). Due to the long cooking period, even a tough bull is made tender, and a very unusual taste is achieved. In most other recipes, Indonesians prefer shorter cooking time when vegetables or meats are cooked in coconut milk. A most exotic Indonesian recipe difficult to mimic outside the tropics is ayam pa’piong, a great invention of the toraja people living in the highland of Sulawesi. Here, cooking takes place inside a hollow bamboo stem: Chicken chunks, ginger, chives and lemon grass stalks are filled into a fresh bamboo stem together with grated coconut. The bamboo is sealed and heated moderately for several hours. When ready, the chicken is steamed to a tender texture, flavoured both by the coconut and the bamboo and emanating a faint lemon odour. Even more coconut recipes are found at peninsular South East Asia, where Thai cooks add a new dimension to the art of cooking with coconut. In Thailand, the term curry (in Thai kaeng or gaeng [แกง]) almost always refers to food cooked in coconut milk. The aromatic pungency so much loved in Thailand is achieved by so-called curry pastes (gaeng prik): These preparations are ground mixtures of chiles with other fresh spices (e. g., ginger, fingerroot, galanga, garlic, onion), dried spices (cumin, coriander seeds) and typically shrimp paste or dried fish, enhanced with fragrant leaves like kaffir lime leaves, lemon grass and coriander leaves. Several standard recipes of curry pastes are known by their colours. Green curry paste (prik gaeng kiaw [พริกแกงเขียว]) contains green chiles, much garlic and coriander leaves. Red curry paste (prik gaeng dang [พริกแกงแดง]) is much hotter, as it derives its colour from ripe red chiles, which are often dried and toasted before usage; an orange variant additionally contains lots of fresh turmeric ( yellow curry paste , prik gaeng liang [พริกแกงเหลือง]). Lastly, there is the masaman curry paste, also written massaman and matsaman (prik gaeng masaman [พริกแกงมัสมั่น]) which is a slightly milder red paste that additionally contains aromatic spices in the Indian fashion (cinnamon, cloves, star anise; also toasted ground coriander fruits); this recipe was introduced to Thailand by Islâmic traders settling in Southern Thailand (masaman derives from Muslim). Once the curry paste is prepared, the further steps in making a Thai curry are quite simple: First, the curry paste may be fried in a little oil until it develops an aromatic smell. Some recipes omit this first step, but it does bring out more flavour with the masaman paste; with other pastes, the opinions about frying are more varied. Then the paste is dissolved in coconut milk and brought to a boil; only then, the other ingredients are added and cooked until tender. At last, the curry is seasoned with fish sauce (nam pla [น๊ำปลา]) and garnished with fresh basil leaves (or coriander leaves). A typical recipe might ask for beef or chicken meat and several types of vegetables (aubergines, potatoes, bamboo shoots). Thai curries have rather thin, almost soupy, structure. Coconut milk does not only look like milk, but it may well used as an alternative for milk in Western desserts (e. g., custards), thus giving an extraordinary and exotic flavour. Coconut milk can also be used in make ice creams (see vanilla). Coconut aroma goes well with chocolate, but it may well be combined with other spices to create unusual sweets. Indonesians use pandanus leaves for this purpose; I like it in combination with tonka beans.